The exact screen size depends on the device you are designing for and how you set up Kiosk Pro, but isn’t too hard to figure out. A full list of iOS devices, including screen size in pixels, is maintained here. 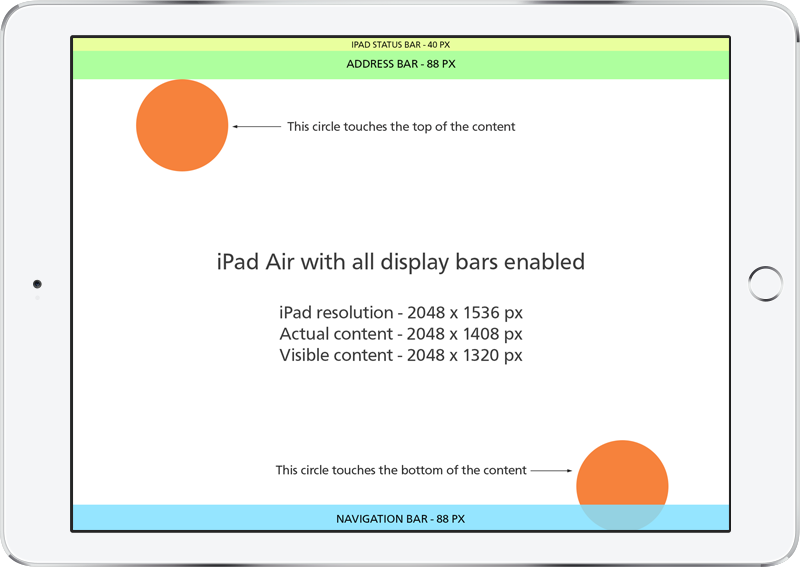 Start with the base size of the Retina iPad screen - 2048 x 1536 pixels. This will be modified based on which display bars you're using. For the iPad status bar, subtract 40 pixels (status bar height on Retina) from the Retina screen height (1536 pixels). For the address bar, subtract 88 pixels (address bar height on Retina) from the previous result. For a web page, it overlays content rather than pushing it down the screen like the status and address bars do. If you are creating a longer page, content will simply scroll and the Navigation Bar will not need to be taken into consideration (beyond possibly thinking about what will appear "above the fold"). However, if you are designing a static page view not meant to scroll (such as an initial splash screen or a homepage navigation menu), you will not subtract the 88 pixels and just be aware that the page will be covered and account for this in your design, making sure that the bar will not overlap important content. For a PDF, the Navigation Bar does not overlay content, but instead occupies its own screen real estate. For ideal sizing of PDF's, you will simply subtract the 88 pixels for the Navigation Bar if you choose to use it. In this example, your web page presentation would have an on-screen dimension of 2048 x 1408, of which you would see 2048 x 1320 (with the bottom 88 pixels covered by the navigation bar). Finally, if you are designing a project for a Retina display, this article describing the difference between display pixels and CSS pixels is excellent.